Red Chile Enchiladas with Chicken and Melted Cheese – Elly Says Opa! I know, I know. Rick Bayless recipes are becoming the new goat cheese recipes on my blog. But, what can I say? When every recipe I’ve tried has been so simple to make and so good, how can I not keep going back to Mexican Everyday? I don’t make enchiladas very often because even though they’re not hard to make, they are fairly time-consuming to assemble. One thing this recipe definitely taught me is that heating the tortillas in the oven, especially since it’s already heating to bake the enchiladas, is much easier than frying or heating each individual tortilla over a burner. I didn’t cook my chicken the night before making this as I had initially planned, so I would say that, start to finish (cooking the chicken to actually sticking the enchiladas in the oven), was about an hour (then add to that the baking time). This recipe was quick and quite tasty, but I have a lot of notes about it, which I decided to put at the end rather than here. I don’t flatter myself – I know not everyone reads my really exciting and incredibly witty introductions. Don’t let the notes fool you. These were good enchiladas. Did I think there were a few problems with the amounts? Yes. Would I change a thing or two next time? Yes. But the point is, there will be a next time. To make the sauce: Set a small or medium skillet over medium heat and once it’s hot, toast the chile pieces a few at a time, pressing them against the hot surface with a spatula until aromatic and lightened in color underneath–about 10 seconds per side. Transfer the toasted chiles to a blender, and add the garlic, tomatoes and juices, cumin and black pepper. Blend to as smooth a consistency as possible. Heat the oil in a large saucepan over medium-high. Set a mesh strainer over the pan and pour in the sauce. Press through the strainer to remove bits of chile skin. Then cook, stirring until the sauce is reduced to the consistency of tomato paste, 5 to 7 minutes. * Pour in the broth, reduce the heat to medium low and summer for 10 minutes. Taste the sauce and season with sugar and salt (Bayless says about 1.5 tsp. but I used closer to .5 tsp). 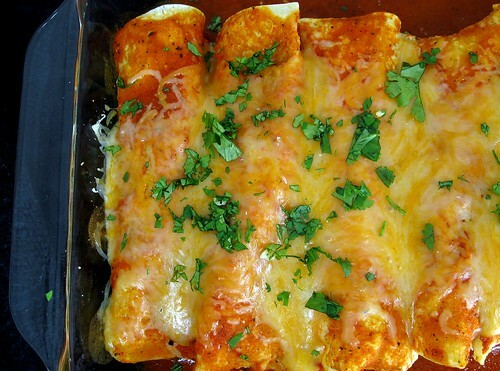 To make the enchiladas: Brush or spray both sides of the tortillas with oil and then stack in twos on a baking sheet. Bake just long enough to make them soft and pliable, about 3 minutes. Remove fro the oven and cover with a towel to keep warm. Spread 1/2 cup sauce over the bottom of a 13×9 baking dish, and stir another 1/2 cup sauce into the chicken. Lay out a warm tortilla, top with a portion of the chicken and roll up. Lay seam side down in the baking dish. Continue filling and rolling the rest of the tortillas and ladle the remaining sauce over the enchiladas* and sprinkle with the cheese. Bake 10-15 minutes, until the cheese starts to brown. Garnish with onion rings and cilantro if desired. I used 5 guajillo chiles, and I’m glad I used an extra one. Typically, 4 oz. of raw chicken will yield about 3 oz. cooked. So, I made this recipe with roughly 12 oz. of raw chicken. However, I still did not have enough chicken to fill 12 enchiladas and only got 8. I would definitely recommend using at least pound of raw chicken, probably closer to 1.25 lbs., if you want to get 12 enchiladas. I roasted my chicken and seasoned it with salt, pepper, a little cumin, and a little oregano. Not sure if I have a weak blender, canned tomatoes that had less juice than the normal or what, but this sauce was hard to push through a strainer. Eventually I did get it all through there but it took some serious elbow grease on my part. Also, for me, the sauce needed to cook closer to about 10 or 11 minutes (not 5-7) before becoming the consistency of tomato paste. I had extra enchilada sauce, but if I made 12 enchiladas, it would have been the right amount.